I went for a jog yesterday morning. Normally, this in itself is an occasion for applause (to me); but on this particular morning I went for a jog while it was raining…ICE. Yes, that’s correct. There was actual ice coming down among the normal wet droplets. To put this momentous achievement of will into context – I will deem the weather in South Africa ‘unfit for a run’ if I see clouds. This morning was just another reminder that winter has come. I’ve been wrapping up with a scarf and sweaters for a while already, but I knew it was ‘proper’ winter here when I had to get out my gloves and beanie as well. I’m going to share a quick and easy winter-warmer broth I enjoy making! 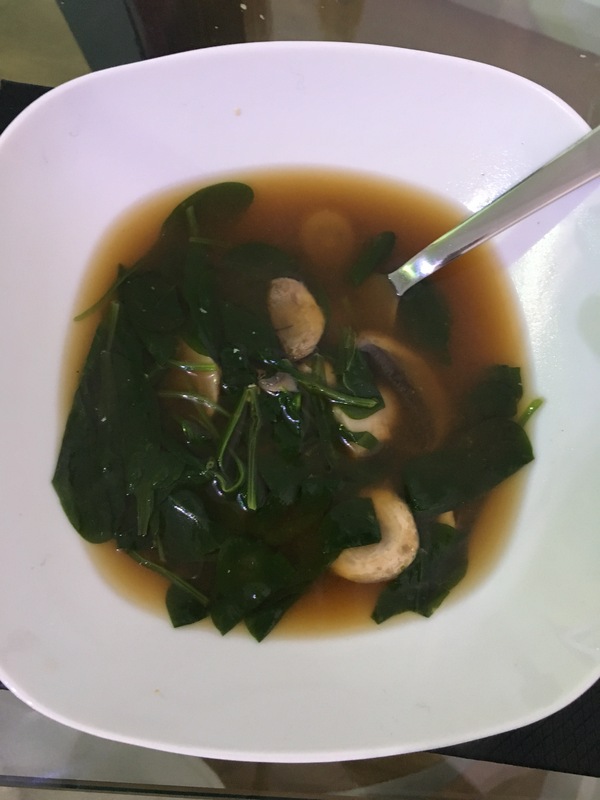 It’s my easy-take on Miso soup. What you basically need is a jar of Miso paste, a stock cube and some soy sauce. The rest is up to you! You can use an array of vegetables (such as spinach, mushrooms, spring onion, cabbage, carrot, aubergine) and a protein – I find tofu works best. You boil your vegetables and tofu in a pot of water and the stock cube, seasoned with salt and pepper (you can add some ginger, garlic and chilli too!) and, once the vegetables are softening, add your miso paste and soy sauce. That’s it! Let it simmer so that all the flavours come out, and it’s ready to go. So simple and warming – and healthy! It’s sure to keep the winter colds and flu at bay. Wishing you all warmth, wherever you may be! Until we meet again…Au revoir Surrey !